The DGX-1 supercomputer can deliver the computing power of 250 two-socket servers in a desktop box, claimed Nvidia, which introduced the system Tuesday at its GPU Technology Conference in San Jose, California. The computer can deliver about 170 teraflops of performance, and multiple boxes on a rack could deliver 2 petaflops of performance. The fastest computer in the world delivers a peak performance of about 10 petaflops. Nvidia says DGX-1 is about 56 times faster than a server with two Intel Xeon-E5 2697 v3 chips, which can deliver about 3 teraflops of performance. 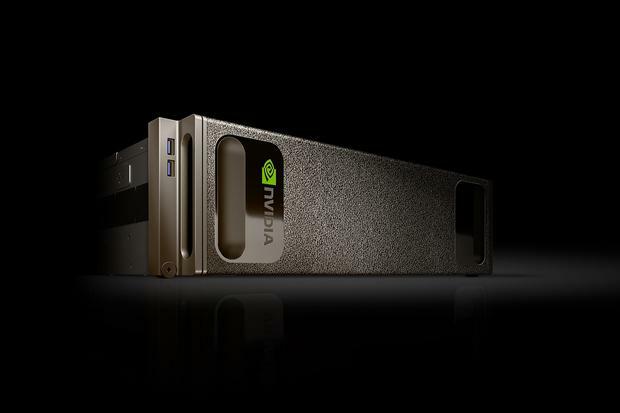 The computer is designed for deep learning, which Nvidia is emphasizing for self-driving cars, robotics and supercomputing. Nvidia claims the DGX-1 can be trained for tasks like image recognition and will perform significantly faster than other servers. Autonomous vehicles and robots can identify objects by cross-referencing them with images residing in cloud-based deep-learning systems that use computers like the DGX-1. Ironically, the DGX-1 runs on two Intel Xeon chips, though Nvidia didn't provide exact CPU details. But it's the other components like the computer's GPUs that provide the serious horsepower. At the center of DGX-1 are eight Tesla P100 graphics processing units, which are based on the company's new Pascal GPU architecture. Nvidia introduced the graphics cards and architecture at GTC, and they are the fastest ever made by the company. The Tesla P100 features several new technologies that give it a horsepower boost. It has a new NVLink interface that can transfer data at 160Gbps (bits per second), which is five times faster than PCI-Express. It also has HBM2 (High-Bandwidth Memory 2) memory, which is made using FinFET technology, in which memory chips are stacked on top of each other. Each GPU has 16GB of HBM2 memory, totaling 128GB for the entire supercomputer. Samsung, which makes HBM2, estimates the memory bandwidth at 256GBps (gigabytes per second), which is two times faster than HBM. AMD uses HBM in its current Fury GPUs, but is moving to HBM2 later this year. The new computer's many GPUs will require a lot of energy, and it will support power supplies drawing between 800 and 3200 watts. Nvidia didn't say whether the system would be air or liquid cooled. It's a small system that draws a lot of power, so it'll need a special cooling system to dissipate the heat, said Jim McGregor, principal analyst at Tirias Research. The DGX-1 also has dual 10 gigabit ethernet slots and 7TB of SSDs for storage and caching. Deep-learning software, algorithms and development tools will be available with the computer. The price for the computer wasn't immediately available, but the system can be ordered from Nvidia.